The 100 Men March for Madiba on Violence Against Women and Children is coordinated by Government Communication and Information System. 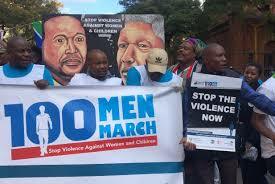 The purpose of the March is to promote the significance of the role of men in preventing violence against women and children; and to galvanise men across all sectors of society to respond to President Cyril Ramaphosa’s “Send me” call by committing themselves to play their part in ending violence and abuse. Its strategic objectives are to work together to break the cycle of violence against women and children; to actively strengthen partnerships with civil society organisations to combat violence in our homes, our communities and in the workplace with the bias towards engaging young men and boys; to encourage positive role modelling by men and challenge perpetrators of these offences to change their behavior; and to provide needed care and support for survivors and victims. Your Municipality is therefore requested to support this event and by availing hundred (100) male officers to pledge their support to break the cycle of violence against women and children.